Another gem of a recipe from my mother. 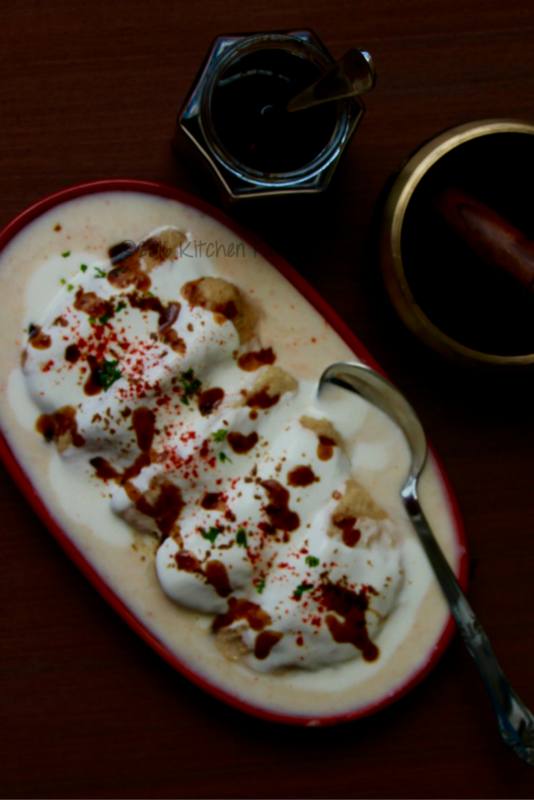 Cold Dahi Bhalle or Dahi Vada served as chaat , or served as a side dish in the main course is always a hit. It is not a very complicated dish but it does need a little labour. 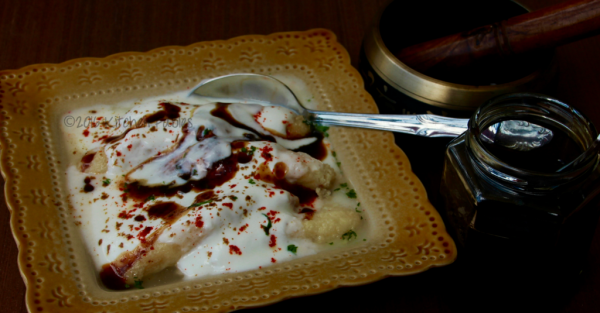 Many people use Baking soda to get the soft and spongy Dahi Bhalle. In my experience it is not needed. What is needed is to beat the ground daal well. 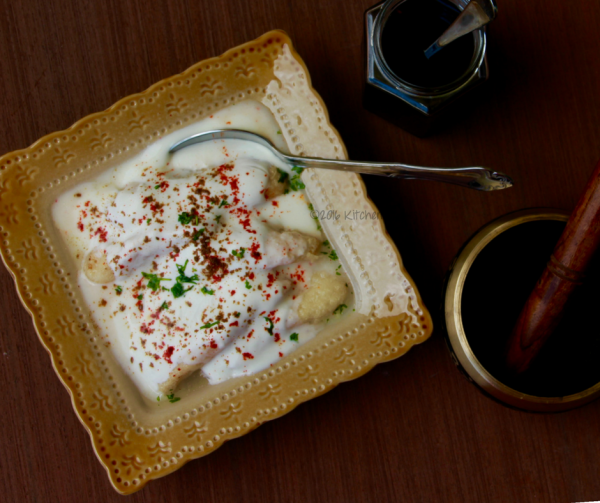 My mother’s stuffed Dahi Bhalle was loved by everyone. For Rakhi or Bhaiya Dooj, my maternal uncles would come to our place and after tying Rakhi, wait eagerly for Chole Bhatoore & Dahi Bhalle. Bhalle or Vada can be made a day prior and soaked in curd. This makes it a good dish to serve a large gathering. 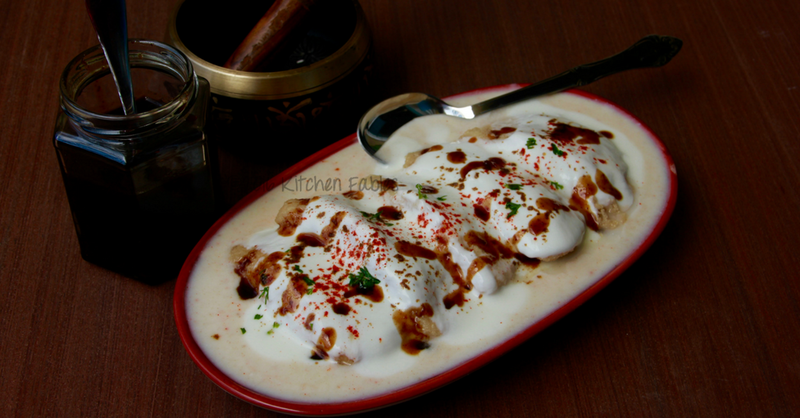 ￼A gem of a recipe from my mother on How to make soft and spongy Stuffed Dahi Bhalle. Soak the dal overnight or minimum of 4 hours. Drain the water and grind dal with as little water as possible I used almost 1/4 cup water. Do not grind dal very fine. The ground dal will be of cream colour. Beat Dal for 10 to 15 minutes and it will change colour to white. To beat the dal you can use a hand beater or just beat it with a spoon in one direction. If the batter is too thick add a little more water. Batter should not be runny. To check if the dal is ready, fill a small bowl with water and drop half spoon of batter, if it floats then the batter is ready. Keep water , salt and asafoetida in a pot besides the gas. In a deep pan heat oil for frying. Take a small plastic sheet , I used the packet of a milk cover. Put a drop of oil and water and spread well. Take one table spoon of Batter and spread in a circular shape. Put 1 teaspoon of stuffing in centre and fold the plastic cover as shown in the pic below. 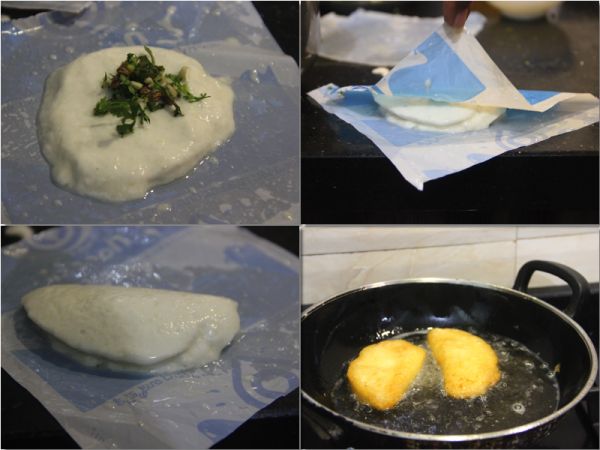 With wet hands lift the Bhalla off the plastic sheet and put in oil for frying. Fry on a low flame and flip when one side is golden. When both the sides are golden take out the bhalla and put it in the water kept aside. After an hour take out the bhalla from water and put it in a strainer and leave it for an hour. Whip the curd with Sugar. Put bhalla in a tray and put half the curd and put it in fridge. Before serving put the rest of the curd and garnish with Black salt, Black pepper powder, Red chilly Powder , Roasted Cumin Powder. Oh I so want this right now. Love the recipe should try it out sometime. Oh Teena how I wish I could send it to you !! Sundari, Cold Dahil Bhallas in evening are bliss !! 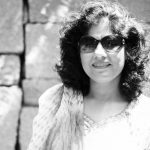 Hi Muthulakshmi, I am so glad that you likes the recipe !! Recipe and pics are saying it must be very soft and mouth melting.. 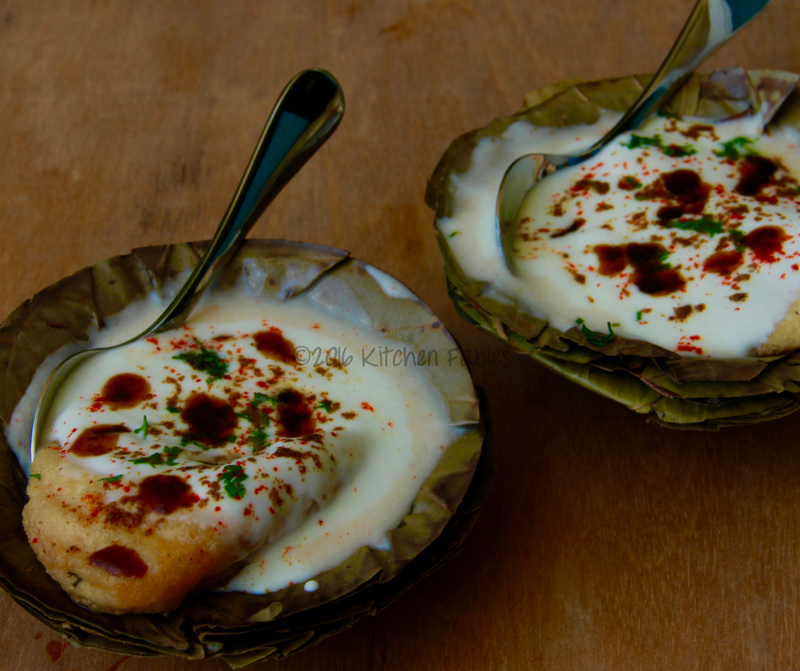 Cold bhallas with red chutney is a perfect match.. Thank you Indu 🙂 ! !